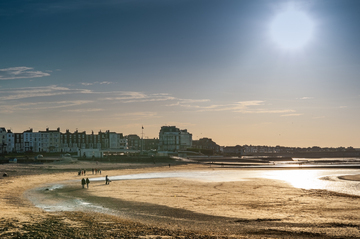 Margate. Sun, sea, sand and...pizza. Not just any pizza. Great. British. Pizza. 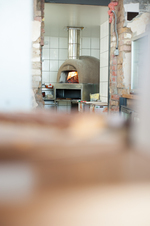 Great British Pizza Company is a reasonably new addition to the Margate seafront (2012) and is testamement to the opportunities that this amazing #Thanet seaside destination has to offer. Opened in June 2012 by entrenpreneurs Rachel Seedy and Lisa Richards, Great British Pizza Company serves unique, simply presented and amazing to taste, wood fired thin base pizza with almost all ingredients sourced locally. You only need to look as far as the stunning recommendations in The Sunday Times, The Guardian, The Observer, The Telegraph and the Daily Mail to get a sense of their growing pedigree. 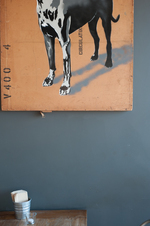 Incidentally, the restuarant is dog-friendly as Henry, their "Head of Marketing and the Chairman of our Board...", a blue Great Dane will attest to! Rachel and Lisa asked us to provide them with a few pizza - food photography - images in preparation for an imminent press release regarding their latest opening of Great British Pizza Company in Exmouth Market, London. A gloriously sunny day beckoned! However, Lisa and Rachel had only requested half a dozen or so pizza photographs so we would only need to be on site for around a hour. We'd agreed 4pm so that the oven would be fired up and also we'd have a little time before the late afternoon influx of pizza and prosecco goers would arrive. On the menu, so to speak, for us was: Margate-rita, Chorizo and chilli, Air-dried ham & rocket, Peppers & goat’s curd and Pear & Cambozola. 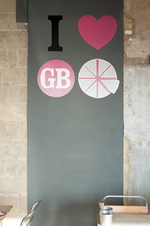 If you've yet to experience the pizzas at GB Pizza Co you'll also not have experienced the staff. Even arriving as a 'supplier' and the 'guy to take the pictures' the guy and gals we're exceptionally helpful and friendly in getting set up. Inside of GB Pizza Co the beautifully grained wood tables provided for the perfect base for the pizzas (excuse all the puns...) and lit by the sun streaming in through the whole front window. Ironically, the sun was actually too bright and those of you that might be interested in the technical side of food photography will note that too bright a light source (and directional) leads to overly bright highlights, heavy shadows and not the best presentation. So, we used an area inside the restuarant that was out of the direct sun. 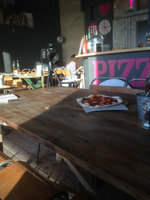 We still made use of the direct sunlight to provide some off-pizza contrast and highlights in some images. A reflector was then used to bounce and feather some of that sunlight into the darker areas of each pizza. Enought chat, here's some pictures of delicious pizza. Finally, couldn't resist including a quick snap of the view just over from the restaurant - enjoy! If you'd ike to know more about GB Piiza Co or make a reservation visit their site here or hook up via Twitter @gbPizzaCo.